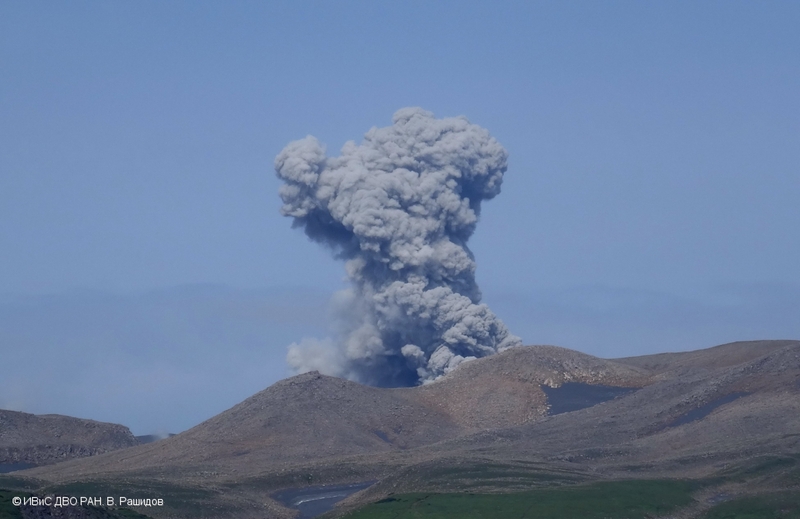 The most recent eruption at Ebeko, a remote volcano in the Kuril Islands, began in October 2016 (BGVN 42:08) with explosive eruptions accompanied by ashfall. Frequent ash explosions were observed through November 2017 and the eruption remained ongoing at that time (BGVN 43:03). Activity consisting of explosive eruptions, ash plumes, and ashfalls continued during December 2017 through May 2018 (table 6). Eruptions were observed by residents in Severo-Kurilsk (about 7 km E), by volcanologists, and based on satellite imagery. The Kamchatkan Volcanic Eruption Response Team (KVERT) is responsible for monitoring Ebeko, and is the primary source of information. The Aviation Color Code (ACC) remained at Orange throughout this reporting period. This color is the second highest level of the four color scale. 1-4 and 7 Dec 2017 2 km -- -- ACC at Orange. Ashfall reported in Severo-Kurilisk. Explosions on 2-4 and 7 Dec.
8, 9, 11 Dec 2017 2.3 km -- -- Explosions. 16, 18-19, and 21-22 Dec 2017 3.5 km 16 km SSW Explosions. Ash plume and weak thermal anomaly on 16 Dec.
25 Dec 2017 1.5 km -- -- Explosion. 01-05 Jan 2018 -- -- -- No activity noted. 08-10 Jan 2018 2.5 km -- -- Explosions. 11-12, 14-16, and 18 Jan 2018 3.1 km -- -- Explosion. Minor ashfall reported in Severo-Kurilsk on 15,16, and 18 Jan.
22-23 Jan 2018 2 km -- -- Explosions. 26-27 and 29-31 Jan 2018 2.5 km -- -- Explosions. Ashfall reported in Severo-Kurilsk on 29 Jan.
05-08 Feb 2018 2.4 km -- -- Explosions. Ashfall reported in Severo-Kurilisk on 8 Feb.
09-10 and 14 Feb 2018 2.2 km -- -- Explosions. 17-18 and 20-21 Feb 2018 2.4 km -- -- Explosions. Ashfall reported in Severo-Kurilisk on 17-18 Feb.
23-25 and 27-28 Feb 2018 3.3 km -- -- Explosions. 06 Mar 2018 1.7 km -- -- Explosions. 12-13 Mar 2018 2.7 km -- -- Explosions. 18 and 21-22 Mar 2018 1.8 km -- -- Explosions. Ashfall reported in Severo-Kurilisk on 17 and 21 Mar. 23-25 and 28-29 Mar 2018 2.3 km -- -- Explosions. 31 Mar-06 Apr 2018 2.7 km -- -- Explosions. 07 and 11-12 Apr 2018 1.8 km -- -- Explosions. Ashfall reported in Severo-Kurilisk on 6 Apr. 15 and 17-19 Apr 2018 2.6 km -- -- Explosions. 21 and 25 Apr 2018 2.5 km -- -- Explosions. 01-03 May 2018 2.8 km -- -- Explosions. 04 and 06-10 May 2018 2.4 km -- -- Explosions. 12-14 May 2018 2.8 km 21 km SW Explosions. Ash plume drifted SW on 13 May. Minor ash explosions were reported throughout the period from December 2017 through May 2018 (figure 17). Minor amounts of ash fell in Severo-Kurilisk at the end of 2017 and into 2018. Ash was reported on 2-4, and 7 December 2017; 15, 16, 18, and 29 January 2018; 8, 17, and18 February; 17 and 21 March; and 6 April. Ash plume altitudes during this reporting period ranged from 1.5 to 3.5 km (table 6); the summit is at 1.1 km. Figure 17. Explosions from Ebeko sent ash up to an altitude of 1.5 km, or about 400 m above the summit, on 6 February 2018. Courtesy of T. Kotenko (IVS FEB RAS). Information Contacts: Kamchatka Volcanic Eruptions Response Team (KVERT), Far Eastern Branch, Russian Academy of Sciences, 9 Piip Blvd., Petropavlovsk-Kamchatsky, 683006, Russia (URL: http://www.kscnet.ru/ivs/kvert/); Institute of Volcanology and Seismology, Far Eastern Branch, Russian Academy of Sciences (IVS FEB RAS), 9 Piip Blvd., Petropavlovsk-Kamchatsky 683006, Russia (URL: http://www.kscnet.ru/ivs/eng/). 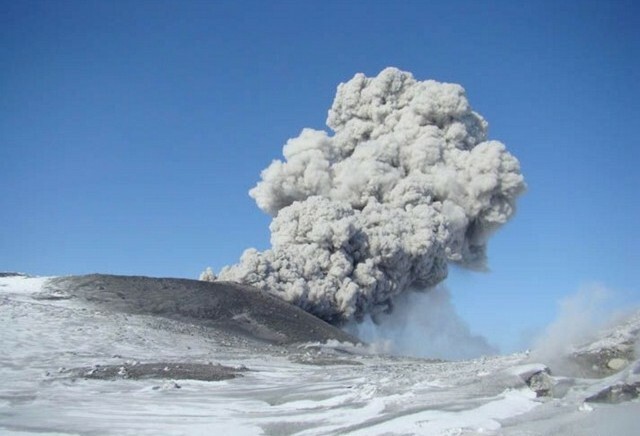 Volcanologists in Severo-Kurilsk (Paramushir Island), about 7 km E of Ebeko, observed explosions during 22, 24-25, and 27-28 March that sent ash plumes up to 4.2 km (13,800 ft) a.s.l. Ash fell in Severo-Kurilsk during 24-25 and 27 March. The Aviation Color Code remained at Orange (the second highest level on a four-color scale). Volcanologists in Severo-Kurilsk (Paramushir Island), about 7 km E of Ebeko, observed explosions during 15-22 February that sent ash plumes to 3.6 km (11,800 ft) a.s.l. The Aviation Color Code remained at Orange (the second highest level on a four-color scale). Volcanologists in Severo-Kurilsk (Paramushir Island), about 7 km E of Ebeko, observed explosions during 8-15 February that sent ash plumes to 2.5 km (8,200 ft) a.s.l. Ash fell in Severo-Kurilsk on 11 February. The Aviation Color Code remained at Orange (the second highest level on a four-color scale). Volcanologists in Severo-Kurilsk (Paramushir Island), about 7 km E of Ebeko, observed explosions during 2-8 February that sent ash plumes to 2.3 km (7,500 ft) a.s.l. Ash fell in Severo-Kurilsk on 4 February. The Aviation Color Code remained at Orange (the second highest level on a four-color scale). Volcanologists in Severo-Kurilsk (Paramushir Island), about 7 km E of Ebeko, observed explosions during 30 November-7 December that sent ash plumes to 3.6 km (11,800 ft) a.s.l. Ash plumes drifted E, causing ashfall in Severo-Kurilsk on 30 November, and 1 and 4 December. The Aviation Color Code remained at Orange (the second highest level on a four-color scale). Volcanologists in Severo-Kurilsk (Paramushir Island), about 7 km E of Ebeko, observed explosions during 23-30 November that sent ash plumes to 4 km (13,100 ft) a.s.l. Ash plumes drifted E. A weak thermal anomaly was identified in satellite data on 24 November, and ashfall was reported in Severo-Kurilsk on 27 and 29 November. The Aviation Color Code remained at Orange (the second highest level on a four-color scale). Volcanologists in Severo-Kurilsk (Paramushir Island), about 7 km E of Ebeko, observed explosions during 15-23 November that sent ash plumes to 3.2 km (10,500 ft) a.s.l. Ash plumes drifted NE and S. The Aviation Color Code remained at Orange (the second highest level on a four-color scale). Volcanologists in Severo-Kurilsk (Paramushir Island), about 7 km E of Ebeko, observed explosions during 9-15 November that sent ash plumes to 4.5 km (14,800 ft) a.s.l. Ash plumes drifted E. A weak thermal anomaly was identified in satellite data during 12-13 November. The Aviation Color Code remained at Orange (the second highest level on a four-color scale). Volcanologists in Severo-Kurilsk (Paramushir Island), about 7 km E of Ebeko, observed explosions during 26 October-2 November that sent ash plumes to 3.7 km (12,400 ft) a.s.l. Ash plumes drifted in multiple directions and caused ashfall in Severo-Kurilsk during 29-31 October. A thermal anomaly was visible in satellite images on 24 and 29 October. The Aviation Color Code remained at Orange (the second highest level on a four-color scale). Volcanologists in Severo-Kurilsk (Paramushir Island), about 7 km E of Ebeko, observed explosions during 19-26 October that sent ash plumes to 4.7 km (15,400 ft) a.s.l. Ash plumes drifted eastward, and caused ashfall in Severo-Kurilsk during 19-20 and 23-24 October; ash plumes drifted about 80 km E on 20 October. A thermal anomaly was visible in satellite images on 24 October. The Aviation Color Code remained at Orange (the second highest level on a four-color scale). Volcanologists in Severo-Kurilsk (Paramushir Island), about 7 km E of Ebeko, observed explosions during 12-19 October that sent ash plumes to 4.5 km (14,800 ft) a.s.l. Ash plumes drifted in multiple directions, and caused ashfall in Severo-Kurilsk during 14-16 October. The Aviation Color Code remained at Orange (the second highest level on a four-color scale). Volcanologists in Severo-Kurilsk (Paramushir Island), about 7 km E of Ebeko, observed explosions during 28 September-5 October that sent ash plumes to 4.5 km (14,800 ft) a.s.l. Satellite images showed a thermal anomaly over the volcano on 27 and 28 September, and ash plumes drifting about 80 km SW, SE, and E during 27-30 September and 1 October. The Aviation Color Code remained at Orange (the second highest level on a four-color scale). Volcanologists in Severo-Kurilsk (Paramushir Island), about 7 km E of Ebeko, observed explosions during 21-28 September that sent ash plumes to 4 km (13,100 ft) a.s.l. Satellite images showed a thermal anomaly over the volcano on 23 and 27 September, and ash plumes drifting as far as 68 km SE during 23-24 and 26-27 September. The Aviation Color Code remained at Orange (the second highest level on a four-color scale). Volcanologists in Severo-Kurilsk (Paramushir Island), about 7 km E of Ebeko, observed explosions during 14-21 September that sent ash plumes to 4.2 km (13,800 ft) a.s.l. A thermal anomaly over the volcano was occasionally visible in satellite data, and an ash plume was identified drifting about 80 km E on 14 September. The Aviation Color Code remained at Orange (the second highest level on a four-color scale). KVERT reported that a thermal anomaly over Ebeko was identified in satellite images during 7, 9, and 12-13 September. Volcanologists in Severo-Kurilsk (Paramushir Island), about 7 km E, observed explosions that sent ash plumes to 3.4 km (11,200 ft) a.s.l. and occasional incandescence during 10-13 September; ash plumes visible in satellite data drifted 113 km SE and NE. The Aviation Color Code remained at Orange (the second highest level on a four-color scale). Volcanologists in Severo-Kurilsk (Paramushir Island), about 7 km E of Ebeko, observed explosions during 24-31 August that sent ash plumes to 3-6 km (17,100 ft) a.s.l. A thermal anomaly was visible in satellite data during 24-25 and 30 August. Ash plumes drifted about 135 km SE, S, and SW during 24-25 and 27-30 August, producing ashfall on 29 and 30 August. The Aviation Color Code remained at Orange (the second highest level on a four-color scale). Volcanologists in Severo-Kurilsk (Paramushir Island), about 7 km E of Ebeko, observed explosions during 11-17 August that sent ash plumes as high as 4.5 km (14,800 ft) a.s.l. An ash plume drifted 52 km SE during 10-11 August, and a thermal anomaly was identified in satellite images on 12 August. The Aviation Color Code remained at Orange (the second highest level on a four-color scale). Volcanologists in Severo-Kurilsk (Paramushir Island), about 7 km E of Ebeko, observed explosions during 20-21 and 25-26 July that sent ash plumes as high as 4 km (13,100 ft) a.s.l. An ash plume drifting about 15 km E was identified in satellite images on 20 July. The Aviation Color Code remained at Orange (the second highest level on a four-color scale). Volcanologists in Severo-Kurilsk (Paramushir Island), about 7 km E of Ebeko, observed explosions during 13-20 July that sent ash plumes as high as 3.4 km (11,200 ft) a.s.l. The Aviation Color Code remained at Orange (the second highest level on a four-color scale). Volcanologists in Severo-Kurilsk (Paramushir Island), about 7 km E of Ebeko, observed explosions during 30 June-1 July that sent ash plumes as high as 3.2 km (10,500 ft) a.s.l. Satellite data showed ash plumes drifting 57 km SE on 1 July. The Aviation Color Code remained at Orange (the second highest level on a four-color scale). Volcanologists in Severo-Kurilsk (Paramushir Island), about 7 km E of Ebeko, observed explosions during 26-27 June that sent ash plumes as high as 3 km (10,000 ft) a.s.l. The Aviation Color Code remained at Orange (the second highest level on a four-color scale). KVERT reported that on 15 June an ash plume from Ebeko was visible in satellite images drifting 14 km SE. 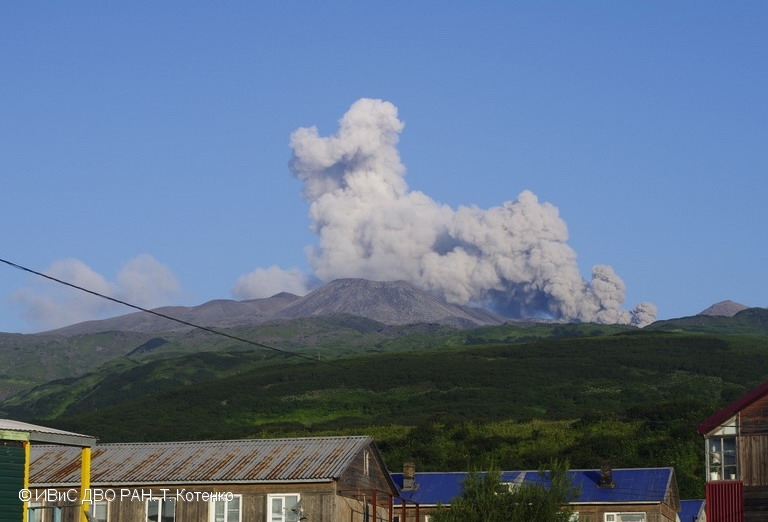 Video data from SVERT and KBGS RAS (Kamchatka Branch, Geophysical Service, Russian Academy of Sciences) showed ash explosions during 17-18 June that sent ash plumes to 2.5-3 km (8,200-10,000 ft) a.s.l. The Aviation Color Code remained at Orange (the second highest level on a four-color scale). KVERT reported that a diffuse ash plume drifting 8 km E of Ebeko was identified in satellite images on 5 June. The Aviation Color Code remained at Orange (the second highest level on a four-color scale). Volcanologists in Severo-Kurilsk (Paramushir Island), about 7 km E of Ebeko, observed explosions during 12-14 May that sent ash plumes as high as 2.8 km (9,200 ft) a.s.l. Ash plumes drifted about 20 km SW on 13 May. The Aviation Color Code remained at Orange (the second highest level on a four-color scale). Volcanologists in Severo-Kurilsk (Paramushir Island), about 7 km E of Ebeko, observed explosions at Ebeko on 4 May and during 6-10 May that sent ash plumes as high as 2.4 km (7,875 ft) a.s.l. The Aviation Color Code remained at Orange (the second highest level on a four-color scale). Volcanologists in Severo-Kurilsk (Paramushir Island), about 7 km E of Ebeko, observed explosions during 1-3 May that sent ash plumes as high as 2.8 km (9,200 ft) a.s.l. The Aviation Color Code remained at Orange (the second highest level on a four-color scale). Volcanologists in Severo-Kurilsk (Paramushir Island), about 7 km E of Ebeko, observed explosions during 21 and 25 April that sent ash plumes as high as 2.5 km (8,200 ft) a.s.l. The Aviation Color Code remained at Orange (the second highest level on a four-color scale). Volcanologists in Severo-Kurilsk (Paramushir Island), about 7 km E of Ebeko, observed explosions during 15 and 17-19 April that sent ash plumes as high as 2.6 km (8,500 ft) a.s.l. The Aviation Color Code remained at Orange (the second highest level on a four-color scale). 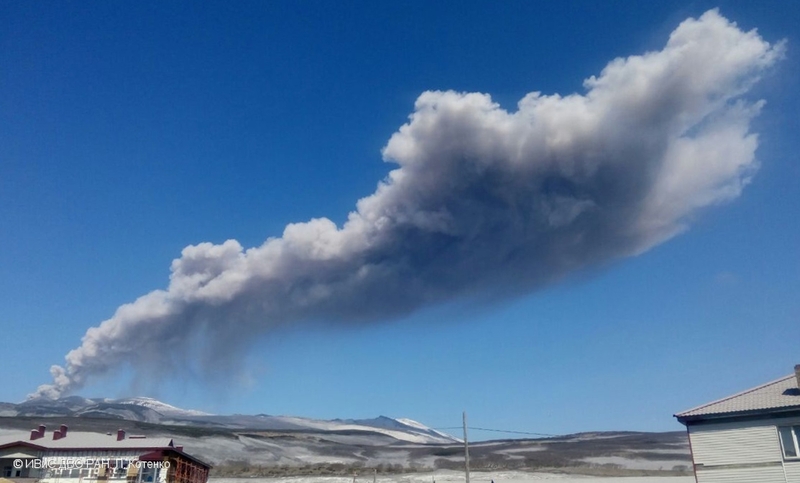 Based on observations by volcanologists in Severo-Kurilsk (Paramushir Island), about 7 km E of Ebeko, explosions during 31 March-6 April generated ash plumes that rose as high as 2.7 km (8,900 ft) a.s.l. The Aviation Color Code remained at Orange (the second highest level on a four-color scale). Based on observations by volcanologists in Severo-Kurilsk (Paramushir Island), about 7 km E of Ebeko, explosions during 23-25 and 28-29 March generated ash plumes that rose as high as 2.3 km (7,500 ft) a.s.l. The Aviation Color Code remained at Orange (the second highest level on a four-color scale). Based on observations by volcanologists in Severo-Kurilsk (Paramushir Island), about 7 km E of Ebeko, explosions during 18 and 21-22 March generated ash plumes that rose as high as 1.8 km (5,900 ft) a.s.l. Ashfall was reported in Severo-Kurilsk on 17 and 21 March. The Aviation Color Code remained at Orange (the second highest level on a four-color scale). Based on observations by volcanologists in Severo-Kurilsk (Paramushir Island), about 7 km E of Ebeko, explosions during 12-13 March generated ash plumes that rose as high as 2.7 km (8,900 ft) a.s.l. The Aviation Color Code remained at Orange (the second highest level on a four-color scale). Based on observations by volcanologists in Severo-Kurilsk (Paramushir Island), about 7 km E of Ebeko, explosions during 23-25 and 27-28 February generated ash plumes that rose as high as 3.3 km (10,800 ft) a.s.l. The Aviation Color Code remained at Orange (the second highest level on a four-color scale). Based on observations by volcanologists in Severo-Kurilsk (Paramushir Island), about 7 km E of Ebeko, explosions during 26-27 and 29-31 January generated ash plumes that rose as high as 2.5 km (8,200 ft) a.s.l. Ash fell in Severo-Kurilsk on 29 January. The Aviation Color Code remained at Orange (the second highest level on a four-color scale). Based on observations by volcanologists in Severo-Kurilsk (Paramushir Island), about 7 km E of Ebeko, explosions during 22-23 January generated ash plumes that rose as high as 2 km (6,600 ft) a.s.l. The Aviation Color Code remained at Orange (the second highest level on a four-color scale). Based on observations by volcanologists in Severo-Kurilsk (Paramushir Island), about 7 km E of Ebeko, explosions during 11-12, 14-16, and 18 January generated ash plumes that rose as high as 3.1 km (10,200 ft) a.s.l. Minor ashfall was reported in Severo-Kurilsk during 15-16 and 18 January. The Aviation Color Code remained at Orange (the second highest level on a four-color scale). Based on observations by volcanologists in Severo-Kurilsk (Paramushir Island), about 7 km E of Ebeko, explosions on 25 December generated ash plumes that rose as high as 1.5 km (4,900 ft) a.s.l. The Aviation Color Code remained at Orange (the second highest level on a four-color scale). KVERT reported that on 16 December an ash plume from Ebeko was identified in satellite images drifting about 15 km SSW. A thermal anomaly was also visible. Volcanologists in Severo-Kurilsk (Paramushir Island), about 7 km E, observed ash plumes from explosions rising as high as 3.5 km (7,500 ft) a.s.l. during 18-19 and 21-22 December. The Aviation Color Code remained at Orange (the second highest level on a four-color scale). Based on observations by volcanologists in Severo-Kurilsk (Paramushir Island), about 7 km E of Ebeko, explosions during 8-9 and 11 December generated ash plumes that rose as high as 2.3 km (7,500 ft) a.s.l. The Aviation Color Code remained at Orange (the second highest level on a four-color scale). Based on observations by volcanologists in Severo-Kurilsk (Paramushir Island), about 7 km E of Ebeko, explosions during 25-26 and 28-30 November generated ash plumes that rose as high as 2 km (6,600 ft) a.s.l. Ashfall was reported in Severo-Kurilsk on 28 November. The Aviation Color Code remained at Orange (the second highest level on a four-color scale). Based on observations by volcanologists in Severo-Kurilsk (Paramushir Island), about 7 km E of Ebeko, explosions during 5 and 7-8 November generated ash plumes that rose as high as 2 km (6,600 ft) a.s.l. The Aviation Color Code remained at Orange (the second highest level on a four-color scale). Based on observations by volcanologists in Severo-Kurilsk (Paramushir Island), about 7 km E of Ebeko, explosions during 27 October-3 November generated ash plumes that rose as high as 2 km (6,600 ft) a.s.l. The Aviation Color Code remained at Orange (the second highest level on a four-color scale). Based on observations by volcanologists in Severo-Kurilsk (Paramushir Island), about 7 km E of Ebeko, explosions during 6-7, 9, and 12 October generated ash plumes that rose as high as 3 km (10,000 ft) a.s.l. Ash fell in Severo-Kurilsk on 7, 9, and 12 October. Aviation Color Code remained at Orange (the second highest level on a four-color scale). Based on observations by volcanologists in Severo-Kurilsk (Paramushir Island), about 7 km E of Ebeko, explosions during 13-14 September generated ash plumes that rose 2.2 km (7,200 ft) a.s.l. The Aviation Color Code remained at Orange (the second highest level on a four-color scale). KVERT reported that satellite images of Ebeko showed a weak thermal anomaly over the volcano on 31 July. Volcanologists working at Kambalny (90 km NE) on 1 August observed explosions generating ash plumes that rose as high as 1.6 km (5,200 ft) a.s.l. The Aviation Color Code remained at Orange (the second highest level on a four-color scale). Based on observations by residents of Severo-Kurilsk (Paramushir Island), about 7 km E of Ebeko, explosions on 1 and 4 July generated ash plumes that rose as high as 2.6 km (8,500 ft) a.s.l. The Aviation Color Code remained at Orange (the second highest level on a four-color scale). Based on observations by residents of Severo-Kurilsk (Paramushir Island), about 7 km E of Ebeko, explosions during 23-30 June generated ash plumes that rose as high as 2 km (6,600 ft) a.s.l. Ashfall was reported in Severo-Kurilsk on 24 and 26 June. The Aviation Color Code remained at Orange (the second highest level on a four-color scale). Based on observations by residents of Severo-Kurilsk (Paramushir Island), about 7 km E of Ebeko, KVERT reported that explosions on 17 and 21 June generated ash plumes that rose as high as 2 km (6,600 ft) a.s.l. The Aviation Color Code remained at Orange (the second highest level on a four-color scale). 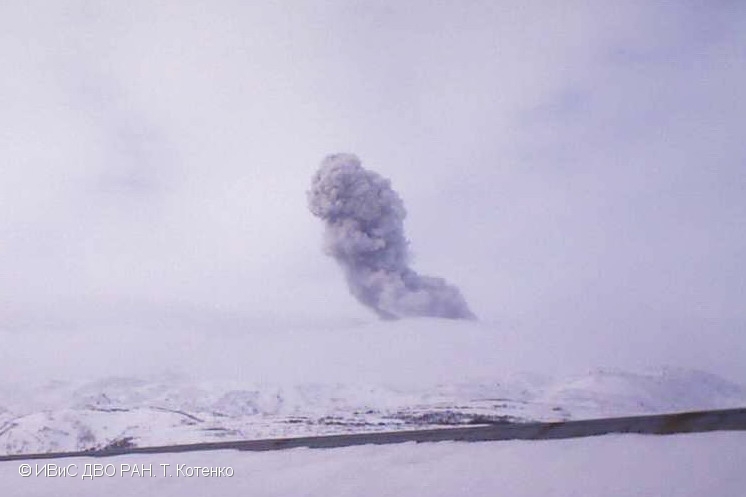 Based on observations by residents of Severo-Kurilsk (Paramushir Island) about 7 km E of Ebeko, KVERT reported that explosive activity continued at the volcano during 2-9 June. The Aviation Color Code remained at Orange (the second highest level on a four-color scale). 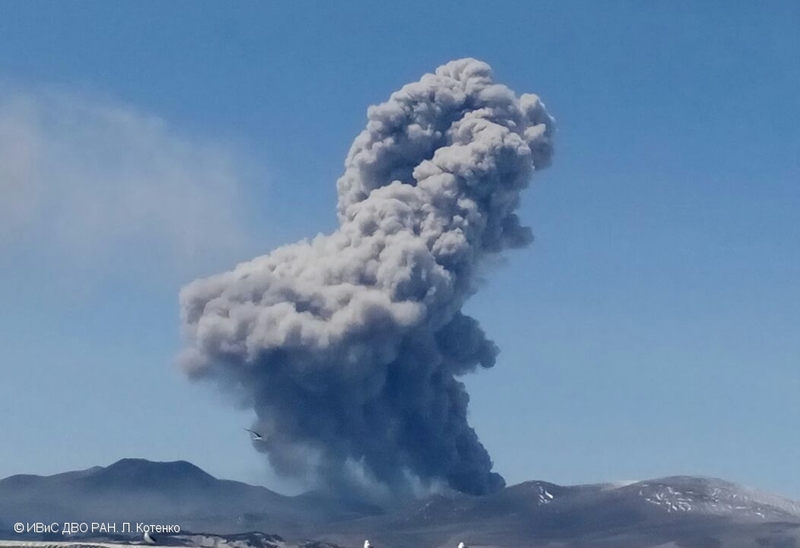 Based on observations by residents of Severo-Kurilsk (Paramushir Island) about 7 km E of Ebeko, KVERT reported that explosive activity continued at the volcano during 25 May-2 June. The Aviation Color Code remained at Orange (the second highest level on a four-color scale). KVERT reported that during 23-24 May explosions at Ebeko were observed by residents of Severo-Kurilsk (Paramushir Island) about 7 km E. Ash plumes rose as high as 2 km (6,600 ft) a.s.l. The Aviation Color Code remained at Orange (the second highest level on a four-color scale). KVERT reported that during 28 April-5 May satellite images of Ebeko showed quiet conditions or weather cloud cover. The Aviation Color Code remained at Orange (the second highest level on a four-color scale). Based on satellite observations, the Tokyo VAAC reported that during 8-9 May plumes rose to altitudes of 2.4-2.7 km (8,000-9,000 ft) a.s.l. and drifted S and NE. The cause of the plumes was unclear, and weather clouds hindered observations. KVERT reported that during 23-26 April several explosions at Ebeko were observed by residents of Severo-Kurilsk (Paramushir Island) about 7 km E. Ash plumes rose as high as 2.1 km (6,900 ft) a.s.l. Minor amounts of ash fell in Severo-Kurilsk on 25 April. The Aviation Color Code remained at Orange (the second highest level on a four-color scale). KVERT reported that during 4-6 April several explosions at Ebeko were observed by residents of Severo-Kurilsk (Paramushir Island) about 7 km E. Ash plumes rose as high as 4 km (13,100 ft) a.s.l. Minor amounts of ash fell in Severo-Kurilsk on 6 April. The Aviation Color Code remained at Orange (the second highest level on a four-color scale). KVERT reported that during 20-22 March several explosions at Ebeko, observed by residents of Severo-Kurilsk (Paramushir Island) about 7 km E, generated plumes that rose to altitudes of 1.7-1.8 km (5,600-5,900 ft) a.s.l. Minor amounts of ash fell in Severo-Kurilsk on 21 March. The Aviation Color Code remained at Orange (the second highest level on a four-color scale). KVERT reported that on 10 March several explosions at Ebeko, observed by residents of Severo-Kurilsk (Paramushir Island) about 7 km E, generated plumes that rose to an altitude of 1.6 km (5,200 ft) a.s.l. The Aviation Color Code remained at Orange (the second highest level on a four-color scale). KVERT reported that during 3-10 March there were 15 explosions at Ebeko observed by residents of Severo-Kurilsk (Paramushir Island) about 7 km E. The Aviation Color Code remained at Orange (the second highest level on a four-color scale). On 10 February KVERT reported that activity at Ebeko had declined, though gas-and-steam emissions continued. The Aviation Color Code was lowered to Yellow (the second lowest level on a four-color scale). KVERT reported that moderate gas-and-steam emissions possibly containing small amounts of ash continued at Ebeko during 27 January-3 February. Minor ashfall was reported in Severo-Kurilsk (Paramushir Island) about 7 km E on 30 January. The Aviation Color Code remained at Orange (the second highest level on a four-color scale). KVERT reported that moderate gas-and-steam emissions possibly containing small amounts of ash may have continued at Ebeko during 20-27 January. The Aviation Color Code remained at Orange (the second highest level on a four-color scale). KVERT reported that gas-and-steam plumes sometimes containing minor amounts of ash were emitted from Ebeko during 30 December 2016-6 January 2017. The Aviation Color Code remained at Orange (the second highest level on a four-color scale). KVERT reported that, according to observers in Severo-Kurilsk (Paramushir Island) about 7 km E, explosions at Ebeko produced ash plumes during 24-27 December that rose to an altitude of 2.5 km (8,200 ft) a.s.l. Minor ashfall was noted in Severo-Kurilsk on 23 and 26 December. The Aviation Color Code remained at Orange (the second highest level on a four-color scale). KVERT reported that, according to observers in Severo-Kurilsk (Paramushir Island) about 7 km E, gas-and-steam plumes containing a small amount of ash rose from Ebeko to an altitude of 1.5 km (4,900 ft) a.s.l. and drifted 8 km N and NE on 17 and 20 December. Minor amounts of ash fell in Severo-Kurilsk during 18-22 December. Ash plumes rose as high as 2 km (6,600 ft) a.s.l. on 27 December. The Aviation Color Code was raised to Orange (the second highest level on a four-color scale). KVERT reported that, according to observers in Severo-Kurilsk (Paramushir Island) about 7 km E, a gas-and-steam plume containing a small amount of ash rose from Ebeko to an altitude of 1.5 km (4,900 ft) a.s.l., and drifted 6 km N during 8-9 December. The Aviation Color Code was raised to Yellow (the second lowest on a four-color scale). During 9-10 December gas-and-steam plumes with minor amounts of ash rose from two vents, in Sredniy Crater (middle part) and Severny Crater (N part), to altitudes of 1.8-1.9 km (4,900 ft) a.s.l. and drifted 4-5 km NW. KVERT reported that, according to observers in Severo-Kurilsk (Paramushir Island) about 7 km E, a gas-and-steam plume continuing ash rose from Ebeko to an altitude of 1.5 km (4,900 ft) a.s.l. and drifted 15 km ENE on 20 October. The Aviation Color Code was raised to Yellow (the second lowest on a four-color scale). Later that day observers noted gas, steam, and ash plumes rising 1.3-1.4 km (4,300-4,600 ft) a.s.l. and drifting 10 km NE. Ground-based and satellite observations during 21-23 October indicated quiet conditions; the Aviation Color Code was lowered to Green on 24 October. KVERT reported that, according to observers in Severo-Kurilsk about 7 km E, activity from Ebeko increased on 2 July. Explosions produced ash plumes that rose to an altitude of 1.8 km (5,900 ft) a.s.l. and drifted SSE. The Level of Aviation Color Code was raised to Yellow. KVERT reported that on 26 October a gas-and-steam plume from Ebeko was seen by observers in Severo-Kurilsk, about 7 km E of Ebeko, rising 300 m above the crater and drifting 1-2 km NNE. There was no evidence of ash deposits on the snow cover. Gas-and-steam plumes rose 250 m above the crater and drifted 2 km E on 28 October and NNE on 29 October. The Level of Aviation Color Code remained at Green. Based on analyses of satellite imagery, the Tokyo VAAC reported that on 26 October a possible eruption plume from Ebeko rose to an altitude of 8.8 km (29,000 ft) a.s.l. and drifted E. Emissions continued the next day. Based on analyses of satellite imagery, the Tokyo VAAC reported that on 15 October a possible eruption plume from Ebeko rose to an altitude of 10.7 km (35,000 ft) a.s.l. and drifted NE. On 31 July, KVERT reported that activity from Ebeko had remained at low levels since 13 July. The Level of Concern Color Code was lowered to Green. KVERT reported that gas-and-steam plumes rose to an altitude of 1.7 km (5,600 ft) a.s.l. during 13-18 June. The Level of Concern Color Code remained at Yellow. KVERT reported that during 9-10 June gas-and-steam plumes from Ebeko rose to an altitude of 2.7 km (8,900 ft) a.s.l. The Level of Concern Color Code remained at Yellow. Based on analysis of satellite imagery and information from Yelizovo Airport, the Tokyo VAAC reported that on 13 June an ash plume rose to an altitude of 2.1 km (7,000 ft) a.s.l. and drifted SW.
Based on analysis of satellite imagery and information from Yelizovo Airport, the Tokyo VAAC reported that on 22 May an ash plume from Ebeko rose to an altitude of 2.4 km (8,000 ft) a.s.l. and drifted SE. KVERT reported that during 24 April-1 May observers from Severo-Kurilsk, about 7 km E of Ebeko, observed continued activity. Gas-and-steam plumes with some ash content rose to an altitude of 3.5 km (11,500 ft) a.s.l. and drifted 6 km in multiple directions. On 23 April, a small amount of ash fell in Severo-Kurilsk. Satellite imagery revealed strips of ash deposits radiating from the crater in different directions on 29 and 30 April. The Level of Concern Color Code remained at Yellow. Based on analysis of satellite imagery and information from Yelizovo Airport, the Tokyo VAAC reported that on 30 April an ash plume rose to an altitude of 1.8 km (6,000 ft) a.s.l. and drifted 20 km E.
KVERT reported that during 17-24 April observers from Severo-Kurilsk, about 7 km E of Ebeko, observed continued activity. Gas-and-steam plumes with some ash content rose to an altitude of 2 km (6,600 ft) a.s.l. during 17-19 April and drifted 8 km NE. On 22 April, light ash fell in Severo-Kurilsk. The Level of Concern Color Code remained at Yellow. Based on analysis of satellite imagery and information from Yelizovo Airport, the Tokyo VAAC reported that during 25-26 April ash plumes rose to altitudes of 1.2-2.1 km (4,000-7,000 ft) a.s.l. and drifted S, SW, and W.
KVERT reported that during 10-17 April observers from Severo-Kurilsk, about 7 km E of Ebeko, observed continued activity. Gas-and-steam plumes with some ash content rose to an altitude of 2.7 km (8,900 ft) a.s.l. and drifted 15 km SE. The Level of Concern Color Code remained at Yellow. Based on analysis of satellite imagery and information from Yelizovo Airport, the Tokyo VAAC reported that on 17 April an ash plume drifted NE at an altitude of 3 km (10,000 ft) a.s.l. KVERT reported that during 3-10 April observers from Severo-Kurilsk, about 7 km E of Ebeko, observed continued activity. Gas-and-steam plumes with some ash content rose to an altitude of 3.4 km (11,200 ft) a.s.l. and drifted 8 km in southerly directions. Light ashfall was reported in Severo-Kurilsk on 5 April. The Level of Concern Color Code remained at Yellow. Based on analysis of satellite imagery and information from Yelizovo Airport, the Tokyo VAAC reported that on 12 April an ash plume drifted 6 km SE at an altitude of 1.5 km (5,000 ft) a.s.l. On 3 April, KVERT reported that the Level of Concern Color Code for Ebeko was raised to Yellow. Observers from Severo-Kurilsk, about 7 km E, reported increased activity; ash-and-gas plumes rose to an altitude of 3.2 km (10,500 ft) a.s.l. and drifted about 20 km NW and E. Ashfall was reported in Severo-Kurilsk on 13, 29, and 31 March up to 0.2 cm thick. Since Ebeko is not monitored by seismic instruments, KVERT relies on visual observations and satellite images for monitoring. Based on analysis of satellite imagery and information from Yelizovo Airport, the Tokyo VAAC reported that on 13 March an ash plume from Ebeko drifted E at an altitude of 0.6 km (2,000 ft) a.s.l. Based on analysis of satellite imagery and information from Yelizovo Airport, the Tokyo VAAC reported that on 11 February an ash plume drifted NE from Ebeko at an altitude of 0.6 km (2,000 ft) a.s.l. On 17 February, an ash plume drifted SW at an altitude of 1.2 km (4,000 ft) a.s.l. According to a news article, gas-and-steam clouds from Ebeko rose to 1.3-1.5 km (4,100-4,800 ft) a.s.l. on 22 March. Nearby residents reported smelling sulfur and chlorine. KVERT reported that no significant changes in activity at Ebeko had been seen on satellite imagery or via ground observations for several months, so the Concern Color Code was reduced from Yellow to Green, the lowest level. A weak scent of hydrogen sulfide and chlorine gas was sometimes noted in the town of Severo-Kurilsk, ~7 km from the volcano. Ebeko is not seismically monitored. According to KVERT, it is likely that activity will stay at low levels and an explosive eruption is not imminent in the next weeks. Strong fumarolic activity continued at Ebeko's crater during 9-16 September. Ebeko remained at Concern Color Code Yellow. On 9 September, KVERT raised the Concern Color Code at Ebeko from Green to Yellow due to an increase in activity at the volcano. Fumarolic activity increased at the Ebeko's crater, with gas temperatures of 480 degrees C.
KVERT reduced the Concern Color Code at Ebeko from Yellow to Green (the lowest level) during 5-12 August. Weak fumarolic activity was observed, and no volcanic activity was visible on satellite imagery during the report week. KVERT raised the Concern Color Code at Ebeko around 29 July from Green to Yellow. During 22-29 July, new fumaroles were noted in the volcano's active crater, and an explosion in the crater emitted hot steam. These types of strong changes in the crater had not been observed since 1982. The Russian Emergency Situations Ministry's Sakhalin department reported renewed activity at Ebeko. Emission clouds reportedly rose to a maximum height of 200 m above the crater and drifted SW. There was no seismic activity at Ebeko during 18-25 March, so KVERT reduced the Concern Color Code from Yellow to Green, the lowest level. On 7 February a small emission of steam, gas, and possibly ash from Ebeko rose ~1 km above the volcano's crater and drifted ~12 km SE. On 8 and 9 February plumes rose to 600 m and thin ash deposits were noted in the town of Severo-Kurilsk, ~7 km from the volcano. Ebeko remained at Concern Color Code Yellow . During 28 January to 4 February, heightened volcanic activity continued at Ebeko. On 1 February gas-and-steam plumes rose to 450 m above ~Ebeko's crater and drifted NE. Ebeko remained at Concern Color Code Yellow . Due to an increase in volcanic activity at Ebeko, on 30 January KVERT raised the Concern Color Code from Green to Yellow. On 27 and 28 January a strong sulfur scent was detected in the town of Severo-Kurilsk, ~7 km from Ebeko. On the 27th a gas-and-steam plume rose ~400 m above the volcano. During 28-29 January, a plume rose ~300 m above the vent on the on the NE side of the volcano's active crater. Ash deposits that were 2-3 mm thick were found 10 m from the vent. Ash extended about 500 m E. At this time a new 7x12-m turquoise lake emerged in the SW part of the active crater. The lake disappeared on 30 January, and there was intensive fumarolic activity where it had been. During the report period, shallow earthquakes were recorded at the Severo-Kurilsk seismic station. Beginning 14 October, two vents on a sheer wall of the N crater began ejecting fine ash and steam to 300 m above the summit. Pulsations of activity occurred 3 or 4 times a day. Ejections reached 1 km height, with a plume that extended horizontally 10-15 km NE. Fissures that formed on the outer E flank of the crater emitted steam. No seismicity preceded or accompanied the ash-steam ejections. The press reported that ash and gas began to be emitted from the main crater before 2100 on 19 October, and the crater lake was emptied of water. A 1-km-high ash column formed on 27 October and the next day a small amount of ash fell on the town of Severo-Kurilsk (a few kilometers away). No casualties resulted from the eruptions. Additional equipment was installed to monitor the volcano. Variations in gas composition of near-crater fumaroles were observed 4 years ago, and an increase in the temperatures of fumarole emissions has been noted since the October eruption. The press reported that scientists did not rule out the possiblilty of a lahar which could pose a danger to the S part of Severo-Kurilsk. Information Contacts: S. Fedotov and I. Menyailov, IV; G. Steinberg, Yuzhno-Sakhalinsk; Moscow Domestic Service; Soviet Sakhalin newspaper. Explosive eruptions began on 14 October, from two of the three vents in the N summit crater. A gas cloud continuously rose 150-250 m while periodic explosions sent ash plumes to heights between 300-400 m and 1,000-1,200 m (table 1). Similar activity continued 14-20 November. A meteorological station in Severo-Kurilsk (6 km S) recorded the explosions. Table 1. Large explosions from Ebeko, 27 October-8 November 1987. 31 Oct 1987 0119 Accompanied by a bright flash. 05 Nov 1987 2100 Minor ashfall and sulfur smell reported in Severo-Kurilsk. 07 Nov 1987 1650 Sulfur smell reported in Severo-Kurilsk. No seismic precursors to the eruption were recorded and the seismic station of the Inst of Marine Geology & Geophysics, in Severo-Kurilsk, did not detect any earthquakes in the region during the eruption. The same station recorded earthquakes before and during the more distant (but much larger) 1981 eruption of Alaid (40 km NW). Specialists from the IV, Petropavlovsk, are working at the volcano. Air observations were made by the Inst of Marine Geology & Geophysics. Further Reference. Menyailov, I.A., Ovsyannokov, A.A., and Shirokov, V.A., 1990, Eruption of Ebeko volcano in October-December 1987: Volc. Seis. (in English), v. 10, p. 493-498. Information Contacts: G. Steinberg, Yuzhno-Sakhalinsk; S. Fedotov, IV. An eruption that began 3 February from Ebeko's N crater formed a new flank vent that emitted ash and gas. The explosive activity ejected a plume that rose 2.5 km in April and May, accompanied by felt seismicity. Fumarole temperatures increased by 30°C. The eruption was continuing in late May. Information Contacts: G. Bogoyavlenskaya and I. Menyailov, IV,. Mild explosive activity from the NW portion of Ebeko's N crater was reported in August and September. . . . activity from a vent 100 m across and 50 m deep occurred at 1-3-hour intervals. Ash was ejected to 800 m. No juvenile material was found in the tephra. Volcaniclastic bombs (<=0.2 m) were ejected onto the crater slopes within 500 m of the vent. The position of the observers was not known, but the only audible explosion occurred 23 September at 1422. On 12 and 13 August, members of an SVE team climbed the volcano and observed fumarolic activity concentrated mainly in the NW vent, the site of the 1989 eruption, and inside the S crater. Small hot water lakes (50-60°C) were present at ~950-1,000 m elev on the outer SE slope of the S crater, ~150 m below the rim. A small cold crescent-shaped lake, slightly acidic, occupied the floor of the N crater. Sulfur deposition from two fumarolic vents 25-40 m N of the hot water lakes at ~950 m elev has produced large vent structures. The smaller structure is bright-yellow, tea-kettle-shaped, and ~1 m high. Pressurized steam, consisting of water vapor and sulfur, was being emitted horizontally towards the E from a small vent opening. The larger structure is ~4-5 m high with two peaks, one on each side of the top. An elongated opening (~2 m long and 60 cm high) in the side of the edifice was emitting a large plume of sulfuric steam, but with less force than at the smaller vent. The last recorded eruption of Ebeko volcano was in 1991. Table 2 summarizes activity on Ebeko from February-April 2004 as reported by observers Leonid and Tatiana Kotenko (observations made on days when clouds did not obscure the volcano). Table 2. A summary showing Ebeko activity for February-April 2004. Courtesy of Leonid and Tatiana Kotenko. On 14 April 2004 a fishing craft reported a white gas plume emerging from Tatarinov volcano. That volcano lies near the opposite (southern) end of Paramushir Island. The plume came from Tatarinov's fumarolic field and remained at low altitude following the Tukharka river. Also in the southern part of Paramushir island, the volcanoes Chikurachki (last active 17-18 April 2003, SEAN 28:07) and Fuss Peak (SEAN 12:04) were both reported quiet. Information Contacts: Leonid and Tatiana Kotenko, Severo-Kurilsk, Paramushir Island; Olga A. Girina, Kamchatka Volcanic Eruptions Response Team (KVERT), a cooperative program of the Institute of Volcanic Geology and Geochemistry, Far East Division, Russian Academy of Sciences, Piip Ave. 9, Petropavlovsk-Kamchatsky, 683006, Russia, the Kamchatka Experimental and Methodical Seismological Department (KEMSD), GS RAS (Russia), and the Alaska Volcano Observatory (USA); Alaska Volcano Observatory (AVO), a cooperative program of the U.S. Geological Survey, 4200 University Drive, Anchorage, AK 99508-4667, USA (URL: http://www.avo.alaska.edu/), the Geophysical Institute, University of Alaska, PO Box 757320, Fairbanks, AK 99775-7320, USA, and the Alaska Division of Geological and Geophysical Surveys, 794 University Ave., Suite 200, Fairbanks, AK 99709, USA. A few gas-and-steam plumes from Ebeko were reported during February-April 2004 (BGVN 29:04). The most recent previous eruption was in January 1991. On 30 January 2005 the Kamchatka Volcanic Eruptions Response Team (KVERT) raised the Concern Color Code at Ebeko from Green to Yellow after reports of a strong smell of sulfur on 27 and 28 January in the town of Severo-Kurilsk, ~ 7 km from Ebeko. 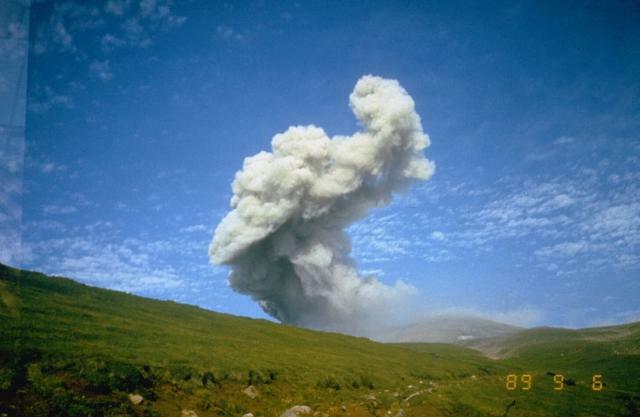 Observations by Leonid and Tatiana Kotenko in Severo-Kurilsk during May-July 2004 included occasional gas-and-steam plume rising as high as 250 m above the volcano during clear weather and fumarolic plumes moving close to the ground. There was no visible activity in August, but a few plumes were seen again from September to November. During 28 January, a white gas-and-steam plume was seen from Severo-Kurilsk rising 400 m above the volcano. Summit observations the next day revealed a yellow-gray, 5-m-diameter, column rising 300 m from a vent on the NE side of the active crater. Three ash layers 2-3 mm thick were noted 10 m from the vent, and ash extended ~ 500 m E into the crater. At this time a new 7 x 12 m turquoise lake had developed in the SW part of the active crater. The lake disappeared on 30 January, and there was intensive fumarolic activity where it had been. Shallow earthquakes were recorded at the Severo-Kurilsk seismic station. On 1 February gas-and-steam plumes rose to 450 m above Ebeko's crater and drifted NE. On 7 February a small emission of steam, gas, and possibly ash rose ~ 1 km above the crater and drifted ~ 12 km SE. On 8 and 9 February plumes rose to 600 m and thin ash deposits were noted in the town of Severo-Kurilsk. The following information came to KVERT from observers in Severo-Kurilsk (Leonid and Tatiana Kotenko). On 15-16 February a dark-gray column rose up to 500 m above the crater. A dark-gray plume extended 6 km E and a light-gray plume 7 km SE. On 16 February ashfall together with snowfall was noted over the strait to the E of Paramushir Island. On 17 February a white column up to 250 m above the crater was observed. On 12 February and 16-17 February a strong smell of a H2S was noted at Severo-Kurilsk. On 18-19 February white gas-and-steam columns 5 m in diameter rose from the two vents up to 450 m above the crater and a new lake (10 x 10 m) on the floor of the active crater was observed. On 25 February white gas-and-steam plumes rose to 450 m and 1,000 m above the crater. Gas-and-steam plumes were also observed on 1-2, 4-5, and 9 March. No ash was seen. A strong smell of H2S was noted at Severo-Kurilsk on 25 February and 2 March. About 20 seismic events of less than Ml 2.0 were observed during 1-9 March at the Severo-Kurilsk seismic station. No seismic activity was observed from 12 to 14 March. On 15 March two seismic events were noted. There was no seismicity during 18-25 March, so KVERT reduced the hazard status from Yellow to Green, the lowest level. The Russian Emergency Situations Ministry's Sakhalin department reported renewed activity on 27 June in the form of emission clouds rising to a maximum height of 200 m above the crater and drifting SW. KVERT did not report any activity, and the Concern Color Code for Ebeko remained at Green. Information Contacts: Olga Girina, Kamchatka Volcanic Eruptions Response Team (KVERT), a cooperative program of the Institute of Volcanic Geology and Geochemistry, Far East Division, Russian Academy of Sciences, Piip Ave. 9, Petropavlovsk-Kamchatsky, 683006, Russia; Alaska Volcano Observatory (AVO), cooperative program of the U.S. Geological Survey, 4200 University Drive, Anchorage, AK 99508-4667, USA (URL: http://www.avo.alaska.edu/), the Geophysical Institute, University of Alaska, PO Box 757320, Fairbanks, AK 99775-7320, USA, and the Alaska Division of Geological and Geophysical Surveys, 794 University Ave., Suite 200, Fairbanks, AK 99709, USA. Our most recent report on Ebeko described minor seismic events between January-June 2005, accompanied by occasional plumes sometimes depositing minor ash (BGVN 30:06). Ebeko lacks a dedicated seismometer; therefore, the Kamchatkan Volcanic Eruption Response Team (KVERT) generally monitors the volcano with visual and satellite observations. The town of Severo-Kurilsk, ~ 7 km E of the summit, has been subjected to considerable environmental stress due to emissions in the past several years (Kotenko and Kotenko, 2009). The volcano is located at the N end of Paramushir Island, just S of the Kamchatka Peninsula. The island hosts five other volcanoes active in the Holocene, including Chikurachki, which was active in 2002, 2003, 2005, 2007, and as recently as September 2008. About 29 July 2005, KVERT raised the Concern Color Code from Green (the lowest level) to Yellow. 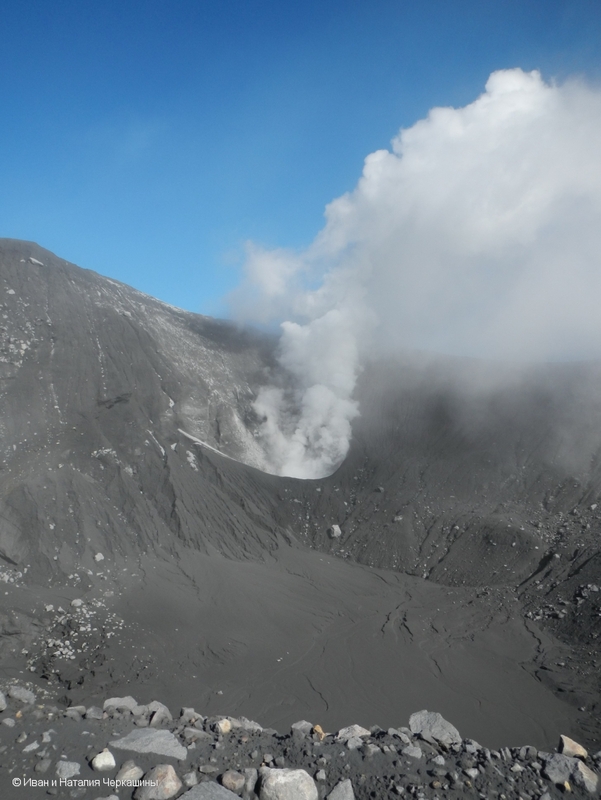 During 22-29 July new fumaroles were noted in the active crater, and there was one explosion reported. This types of activity had not been observed since 1982. During 3-9 August fumarolic activity continued. During the week of 5-12 August 2005 weak fumarolic activity was noted, but no volcanic activity was visible on satellite imagery. Strong fumarolic activity occurred during 9-16 September, and gas temperatures reached 480°C. During the week 22-28 February 2006, KVERT reported that no significant changes in activity had been seen on satellite imagery or via ground observations for several months, so the Concern Color Code was reduced to Green. A weak scent of hydrogen sulfide and chlorine gas was sometimes noted in Severo-Kurilsk. No additional information was available about Ebeko until March 2007. According to a news article in RIA Novosti, on 22 March gas-and-steam clouds from the volcano rose to an altitude of 1.3-1.5 km. Nearby residents smelled sulfur and chlorine. Ebeko was not reported on again until February 2009. According to the Tokyo Volcanic Ash Advisory Center (VAAC) and KVERT, between 11 February and 18 June 2009, the volcano emitted a series of gas-and-steam plumes containing some ash (table 3, figure 1). During 29 January-23 February, the cumulative ashfall was 80 g/m2. Table 3. Gas-and-steam plumes from Ebeko containing some ash between 11 February 2009 and 18 June 2009. Information was provided by the Tokyo Volcanic Ash Advisory Center based on an analysis of satellite imagery and information from Yelizovo Airport, and KVERT. Figure 1. Ash layers from Ebeko deposited in ~ 70 cm of snow and excavated and photographed on 26 February 2009. The layers were thin. More layers were deposited later (see text below). Courtesy of Leonid Kotenko (IV&S). Ashfall deposits in Severo-Kurilsk on 13-14, 18, 29, and 31 March 2009 (figures 2 and 3) were up to 2 mm deep. The town also experienced light ashfall on 5 and 22-23 April. Accordingly, on 3 April 2009 the Level of Concern Color Code was raised to Yellow. On 31 July, KVERT reported that activity had remained low since 13 July, and thus lowered the Level of Concern Color Code to Green. Figure 2. Ash cloud from Ebeko blowing towards Severo-Kurilsk, Paramushir Island, on 14 March 2009. Photographed by Tania Kotenko (IV&S). Figure 3. A photo showing an Ebeko explosion on 18 March 2009. Photographed by Leonid Kotenko (IV&S). Hazards and impacts on Severo-Kurilsk. Kotenko and Kotenko (2009) discussed the environmental impacts of Ebeko on Severo-Kurilsk. Threats include lahars, ashfalls, atmospheric poisoning from volcanic gases (particularly during periods of strong fumarolic activity), and the pollution of potable water supplies. Narrow river gorges descending the volcano can direct volcanic gas into Severo-Kurilsk, which lies in a lowland, accentuating the air pollution problem. The study noted the stresses on inhabitants during strong fumarolic activity of the kind seen during the 2- to 3-year-long intervals leading to eruptions. Historical eruptions occurred in 1793, 1833-34, 1859, 1934-35, 1967-71, and 1987-90. Reference. Kotenko, Tatyana, and Kotenko, Leonid, 2009, Status of Ebeko volcano (Paramushir Island) and environmental impact of its eruptions, [in Russian] in Volcanism and Geodynamics: Content of 4th Russian symposium on volcanology and paleovolcanology: Yevgeny Gordeev (chief editor), IV&S Far East Division, Russian Academy of Sciences, 23-29 September 2009, v. 2, p. 613-617 [ISBN 978-5-902424-05-5]. Information Contacts: Kamchatka Volcanic Eruptions Response Team (KVERT), Far East Division, Russian Academy of Sciences, 9 Piip Blvd., Petropavlovsk-Kamchatsky, 683006, Russia (URL: http://www.kscnet.ru/ivs/); Olga Girina (KVERT); Leonid Kotenko, Institute of Volcanology and Seismology (IV&S); Tokyo Volcanic Ash Advisory Center (VAAC), Tokyo, Japan (URL: http://ds.data.jma.go.jp/svd/vaac/data/); RIA Novosti (URL: http://en.rian.ru/). Our most recent report on Ebeko (BGVN 34:08) described intermittent activity from mid-2005 to mid-2009, primarily plumes that sometimes deposited minor ash. Ebeko lacks a dedicated seismometer; therefore, the Kamchatkan Volcanic Eruption Response Team (KVERT) generally monitors the volcano with visual and satellite observations (figure 4). Intermittent plumes continued in 2009-2010. Figure 4. Topographic map of Paramushir Island (Ebeko volcano sits at the extreme NE end and town of Severo-Kurilsk is nearby). From National Oceanic and Atmospheric Administration Tactical Pilotage Chart ONC-E10C, as provided by McGimsey and others (2005). Activity during October 2009. Based on analyses of satellite imagery, the Tokyo VAAC reported two possible eruption plumes from Ebeko in October 2009. The first plume, reported on 15 October 2009, rose to an altitude of 10.7 km and drifted NE. The second plume, on 26 October, rose to an altitude of 8.8 km and drifted E.
KVERT reported that on 26 October a gas-and-steam plume was seen by observers in Severo-Kurilsk (figure 4), a town about 7 km E of Ebeko. The plume rose about 300 m above the crater and drifted 1-2 km NNE. Gas-and-steam plumes rose 250 m above the crater and drifted 2 km E on 28 October and NNE on 29 October 2009. Activity during June-July 2010. KVERT reported that activity increased on 2 July according to observers in Severo-Kurilsk (figure 5). Explosions produced ash plumes that rose to an altitude of 1.8 km and drifted SSE. The Aviation Color Code was raised to Yellow. On 23 July, KVERT reported that the Aviation Color Code was lowered to Green. Visual observations and satellite data indicated no activity from the volcano during 16-23 July. Figure 5. Photograph of an ash explosion from Ebeko on 2 July 2010 taken from the town of Severo-Kurilsk. Photo taken by Leonid Kotenko. Information Contacts: Kamchatka Volcanic Eruptions Response Team (KVERT), Far East Division, Russian Academy of Sciences, 9 Piip Blvd., Petropavlovsk-Kamchatsky, 683006, Russia (URL: http://www.kscnet.ru/ivs/); Tokyo Volcanic Ash Advisory Center (VAAC), Tokyo, Japan (URL: http://ds.data.jma.go.jp/svd/vaac/data/). Following explosions that produced ash plumes in early July 2010 (BGVN 36:07), no additional activity was noted from Ebeko by the Kamchatkan Volcanic Eruption Response Team (KVERT) until October 2016. This rather remote volcano on the N end of Paramushir Island in the Kuril Islands (figure 6) contains many craters, lakes, and thermal features (figure 7). Ash plumes were observed on 20 October 2016 and continued to be detected intermittently through 19 April 2017 (table 4). Figure 6. Satellite imagery from Google Earth showing the location of Ebeko volcano on the N end of Paramushir Island, Kuril Islands. The village and seaport of Severo-Kurilsk, the largest populated center on the island, is about 7 km E. Courtesy of Google Earth; specific sources of data are shown on the image. Figure 7. Sketch map showing features in the crater area of Ebeko volcano. (1) thermal fields in pink, (2) fumaroles, (3) pots of thermal water, (4) crater lakes in blue, (5) rims of major craters. Roman numerals denote thermal fields: (I) Active Funnel (in the North Crater), (II) South Crater, (III) West Field, (IV) Northeastern Field, (V) Gremuchaya fumarole field, (VI) Florenskii fumarole field, (VII) First Eastern Field, (VIII) Second Eastern Field, (IX) Southeastern Field, (X) Lagernyi Brook field, (XI) Second Southeastern Field, (XII) Third Southeastern Field. From Rychagov and others, 2010. Table 4. Summary of activity at Ebeko volcano from mid-October 2016 to mid-April 2017. ACC is Aviation Color Code. Data courtesy of KVERT. 20 Oct 2016 1.5 km; 1.3-1.4 km 15 km; 10 km ENE; NE ACC raised to Yellow. 24 Oct 2016 -- -- -- ACC lowered to Green. 08-09 Dec 2016 1.5 km 6 km N ACC raised to Yellow. 09-10 Dec 2016 1.8-1.9 km 4-5 km NW Minor amounts of ash from two vents, in Sredniy Crater (middle) and Severny Crater (northern). 24-27 Dec 2016 2-2.5 km -- -- Ash plumes; ACC raised to Orange on 27 Dec.
30 Dec 2016-06 Jan 2017 -- -- -- Gas and steam plumes, minor ash. 12 Jan 2017 -- -- -- ACC lowered to Yellow. 19 Jan 2017 2 km 3 km SW ACC raised to Orange. 20 Jan-03 Feb 2017 -- -- -- Minor ashfall in Severo-Kurilsk on 30 Jan.
10 Feb 2017 -- -- -- Activity declined; ACC lowered to Yellow. 27 Feb 2017 2 km 6 km N ACC raised to Orange. 24, 26, 27 Feb 2017; 02 Mar 2017 up to 2.5 km -- -- Explosions. 03-10 Mar 2017 1.6 km -- -- 15 explosions. 20-22 Mar 2017 1.7-1.8 km -- -- Several explosions; minor ashfall in Severo-Kurilsk on 21 Mar. 24-31 Mar 2017 1.5-3.4 km -- -- Several daily explosions; minor ashfall in Severo-Kurilsk on 26 Mar. 04-06 Apr 2017 4 km -- -- Several explosions; minor ashfall in Severo-Kurilsk on 6 Apr. 07-14 Apr 2017 2.6 km -- -- Several explosions; minor ashfall in Severo-Kurilsk on 12 Apr. 14, 16, 19 Apr 2017 3.2 km -- -- Several explosions; minor ashfall in Severo-Kurilsk on 18 Apr; ACC remained at Orange. According to observers about 7 km E in the city of Severo-Kurilsk, a gas-and-steam plume containing a small amount of ash rose from Ebeko on 20 October 2016 (figure 8), marking the start of its most recent eruption. The Aviation Color Code (ACC) was raised from Green to Yellow. Later that day observers noted gas, steam, and ash plumes rising from the volcano. Ground-based and satellite observations during 21-23 October indicated quiet conditions; consequently, the ACC was lowered to Green on 24 October. Figure 8. Ash explosions from Ebeko at 2245 UTC on 19 October 2016 were photographed from Severo-Kurilsk, 7 km E of the volcano. Photo by T. Kotenko; courtesy of Institute of Volcanology and Seismology FEB RAS, KVERT. On 8-9 December 2016 the ACC was again raised to Yellow when a gas and steam plume containing a small amount of ash was observed. Ash rose from both Sredniy Crater (middle) and Severny Crater (northern) during 9-10 December (figure 9). Further ash plumes were seen during 17-27 December the ACC was raised to Orange. Minor ash was reported during 30 December 2016-6 January 2017, along with gas and steam plumes. An ash plume rose up to 2 km altitude on 19 January (figure 10), and ash fell in Severo-Kurilsk on 30 January. More frequent explosions took place between 24 February and 19 April 2017 (table 4). Simultaneous explosions from two craters was observed on 15 April (figure 11). Figure 9. Explosive ash eruption from the Ebeko craters at 0116 UTC on 10 December 2016. Photo by L. Kotenko; courtesy of Institute of Volcanology and Seismology FEB RAS, KVERT. Figure 10. Ash from an explosive eruption of Ebeko on 19 January 2017 rose up to 2 km altitude. Photo by T. Kotenko; courtesy of Institute of Volcanology and Seismology FEB RAS, KVERT. Figure 11. Explosions at Ebeko generated ash plumes simultaneously from the active Severny (northern) and Sredniy (middle) craters on 15 April 2017. Photo by T. Kotenko; courtesy of Institute of Volcanology and Seismology FEB RAS, KVERT. Satellite thermal data from MODVOLC showed no thermal alerts for at least the last 10 years, and MIROVA only identified two low-power anomalies in the past year, one in late February 2017 and the other in late March 2017. Reference: Rychagov S.N., Belousov V.I., Kotenko ?.A., and Kotenko L.V., 2010, Gas-hydrothermal system of the geothermal deposit, Proceedings World Geothermal Congress 2010 Bali, Indonesia, 25-29 April 2010, 4 p.
Information Contacts: Kamchatka Volcanic Eruptions Response Team (KVERT), Far Eastern Branch, Russian Academy of Sciences, 9 Piip Blvd., Petropavlovsk-Kamchatsky, 683006, Russia (URL: http://www.kscnet.ru/ivs/kvert/); Institute of Volcanology and Seismology, Far Eastern Branch, Russian Academy of Sciences (IVS FEB RAS), 9 Piip Blvd., Petropavlovsk-Kamchatsky 683006, Russia (URL: http://www.kscnet.ru/ivs/eng/); Hawai'i Institute of Geophysics and Planetology (HIGP) - MODVOLC Thermal Alerts System, School of Ocean and Earth Science and Technology (SOEST), Univ. of Hawai'i, 2525 Correa Road, Honolulu, HI 96822, USA (URL: http://modis.higp.hawaii.edu/); MIROVA (Middle InfraRed Observation of Volcanic Activity), a collaborative project between the Universities of Turin and Florence (Italy) supported by the Centre for Volcanic Risk of the Italian Civil Protection Department (URL: http://www.mirovaweb.it/). Ebeko volcano is located on the remote N end of Paramushir Island in the Kuril Islands and contains many craters, lakes, and thermal features. Eruptions and ash plumes were observed at Ebeko in early July 2010 (BGVN 36:07). No additional activity was reported from Ebeko until October 2016, marking the start of the more recent eruptive cycle. New explosive eruptions accompanied by ash fall began on 20 October 2016 through April 2017 (BGVN: 42:08). Explosive eruptions, ash plumes, ash falls were observed and reported at a regular frequency during this reporting period from May through November 2017 (table 5). Eruptions were reported by observations from residents in the town of Severo-Kurilsk, located about 7 km E of Ebeko, by volcanologists and by satellite imagery. The Kamchatkan Volcanic Eruption Response Team (KVERT) is responsible for monitoring Ebeko, and is the primary source of information. The Aviation Color Code (ACC) remained at Orange throughout this reporting period. This color is the second highest level of the four color scale. Table 5. Summary of activity at Ebeko volcano from May 2017 to November 2017. Aviation Color Code (ACC) is a 4-color scale. Data courtesy of KVERT. Explosives events, bursts of ash, ashfall, and ash plumes were reported throughout this period, and were quite variable in appearance (figures 12-16). Minor amounts of ash fell in Severo-Kurilsk on 25 April, 2-3, 6-7, 16, and 18 September, and 22 November. Ash plume altitudes during this reporting period ranged from 1.5 to 4 km; with the highest altitude of 4 km recorded on 2 September (table 5). Figure 12. Ash plume from an explosive event at Ebeko on 15 May 2017. Ash plume altitude reached 2 km. Photo by L. Kotenko, courtesy of Institute of Volcanology and Seismology IVS FEB RAS. Figure 13. Ash plume from an explosive event at Ebeko on 23 May 2017. Ash plume altitude reached 2 km. Photo by L. Kotenko, courtesy of Institute of Volcanology and Seismology IVS, FEB, RAS. Figure 14. Ash explosions from Ebeko on 10 August 2017 as seen from Severo-Kurilsk, 7 km E. Photo by V. Rashidov, courtesy of Institute of Volcanology and Seismology IVS FEB RAS. Figure 15. Ash bursts up to 2 km on 22 August 2017. Photo by T. Kotenk. Courtesy of Institute of Volcanology and Seismology IVS FEB RAS. Figure 16. Active crater of Ebeko volcano on 13 September 2017. Ash plume altitude reached 2.2 km. Photo by Ivan and Nataliya Cherkashiny. Courtesy of Institute of Volcanology and Seismology IVS FEB RAS. MIROVA only identified two low-power thermal anomalies in the past year, one in late February 2017 and the other in late March 2017. A weak thermal anomaly was reported by KVERT on 31 July 2017. Information Contacts: Kamchatka Volcanic Eruptions Response Team (KVERT), Far Eastern Branch, Russian Academy of Sciences, 9 Piip Blvd., Petropavlovsk-Kamchatsky, 683006, Russia (URL: http://www.kscnet.ru/ivs/kvert/); Institute of Volcanology and Seismology, Far Eastern Branch, Russian Academy of Sciences (IVS FEB RAS), 9 Piip Blvd., Petropavlovsk-Kamchatsky 683006, Russia (URL: http://www.kscnet.ru/ivs/eng/); MIROVA (Middle InfraRed Observation of Volcanic Activity), a collaborative project between the Universities of Turin and Florence (Italy) supported by the Centre for Volcanic Risk of the Italian Civil Protection Department (URL: http://www.mirovaweb.it/). The flat-topped summit of the central cone of Ebeko volcano, one of the most active in the Kuril Islands, occupies the northern end of Paramushir Island. Three summit craters located along a SSW-NNE line form Ebeko volcano proper, at the northern end of a complex of five volcanic cones. Blocky lava flows extend west from Ebeko and SE from the neighboring Nezametnyi cone. The eastern part of the southern crater contains strong solfataras and a large boiling spring. The central crater is filled by a lake about 20 m deep whose shores are lined with steaming solfataras; the northern crater lies across a narrow, low barrier from the central crater and contains a small, cold crescentic lake. Historical activity, recorded since the late-18th century, has been restricted to small-to-moderate explosive eruptions from the summit craters. Intense fumarolic activity occurs in the summit craters, on the outer flanks of the cone, and in lateral explosion craters. Melekestsev I V, Dvigalo V N, Kiryanov V Y, Kurbatov A V, Nesmachnyi I A, 1994. Ebeko volcano, Kuril Islands: eruptive history and potential volcanic hazards, Part II. Volc Seism, 15: 411-430 (English translation). Menyailov I A, Nikitina L P, Budnikov V A, 1992. Activity of Ebeko volcano in 1987-1991: character of eruptions, composition of erupted material, volcanic hazard for Severo-Kurilsk. Volc Seism, 1992(5-6): 21-33 (English translation 1993, 14: 515-531). There is no Deformation History data available for Ebeko. There is no Emissions History data available for Ebeko. An ash-bearing eruption column rises above the North crater of Ebeko volcano on September 9, 1989. An explosive eruption that began on February 2, 1989 continued until April 1990. Three summit craters located along a SSW-NNE line form Ebeko volcano proper, which occupies the northern end of a complex of five volcanic cones at the northern end of Paramushir Island. Historical activity, recorded since the late-18th century, has been restricted to small-to-moderate explosive eruptions from the summit craters. An ash plume rises above Ebeko volcano on March 18, 2009. Intermittent explosive eruptions began on February 11, 2009 and continued into July, producing plumes up to 3.4 km altitude. Photo by Leonid Kotenko, 2009 (Institute of Volcanology and Seismology). There are no samples for Ebeko in the Smithsonian's NMNH Department of Mineral Sciences Rock and Ore collection. Large Eruptions of Ebeko Information about large Quaternary eruptions (VEI >= 4) is cataloged in the Large Magnitude Explosive Volcanic Eruptions (LaMEVE) database of the Volcano Global Risk Identification and Analysis Project (VOGRIPA).